What follows is an alternative, conceptual catastrophic ideology for gas giant planet and companion star formation. When a collapsing prestellar object has excess angular momentum, it forms a diminutive core surrounded by a much larger doughnut-shaped envelope supported by angular momentum, but rather than slowly accreting gas from the envelope, as suggested by the standard model of star formation, this conceptual alternative idelology evokes a catastrophic mechanism. When the mass in the angular-momentum-supported envelope is much greater than its diminutive core the system is dynamically unstable, promoting disk instability in a catastrophic process which turns the system inside out, designated, 'flip-flop fragmentation' (FFF). FFF disk instability causes the envelope to break its radial symmetry, causing it to gravitationally clump to form a more massive (younger) core, which inertially injects the former (older) core into a satellite orbit around the new core. This mechanism catastrophically projects mass inward, while conserving system angular momentum. Imagine joining the ends of a Slinky together to form a doughnut-shaped envelope with a golf ball in the center to represent the core. Then catastrophic FFF can be represented by releasing the Slinky, causing the ends to snap together to form a new larger core, with the golf ball as a satellite. 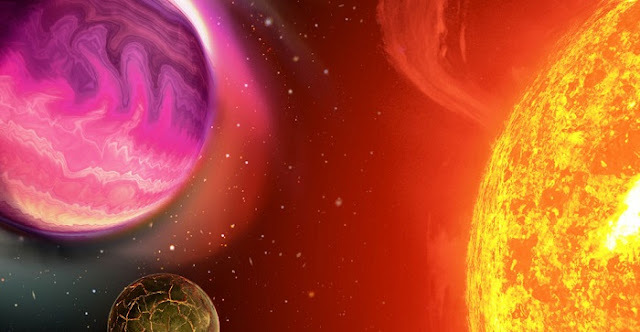 In the HD 87646 system, the process apparently occurred three times in succession (spinning off 3 generations of former cores), before the final core attained sufficient stability to reach the protostar phase, where a protostar is defined as the formation of a 'second hydrostatic core' (SHSC). The first-generation FFF spun off the companion star (at 22 AU), the second-generation FFF spun off the 57 Mj brown dwarf (HD 87646с in a 673 day orbital period) and the third-generation FFF spun off the 12.4 Mj super Jupiter (HD 87646b in a 13.5 day orbital period). This nominally makes companion stars, brown dwarfs and gas giant planets older than their supposed progenitor stars; however, since ejected cores themselves typically undergo one or more generations of FFF, the largest moon around the most distant gas giant planet in a (solitary star) system is likely to be the oldest object in the system, if only by a whisker. if Occam's razor has any validity at all, the compelling simplicity of FFF beats core accretion (particularly in this turbulent system) hands down. Additionally, FFF is a primary predictive mechanism which doesn't require secondary ad hoc planetary migration mechanism to reverse the falsification of pebble accretion by the finding of hot Jupiters in low hot orbits.